Astrophysics is the branch of astronomy that deals with the physics of the universe, including the physical properties of celestial objects such as galaxies, stars, planets, exoplanets, and the interstellar medium, as well as their interactions. Because astrophysics is a very broad subject, astrophysicists typically apply many disciplines of physics, including mechanics, electromagnetism, statistical mechanics, thermodynamics, quantum mechanics, relativity, nuclear and particle physics, and atomic and molecular physics. Astrophysics can be studied at the bachelors, masters, and Ph.D. levels in aerospace engineering, physics, or astronomy departments at many universities. Astrophysics is a good option at the postgraduate level. 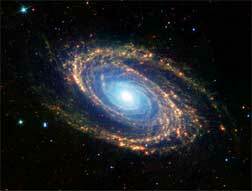 The subject deals with the study of physical properties of stars and galaxies. Research or higher studies in this discipline would need a solid grounding in physics and mathematics. After completing Plus Two, you can either opt for research-oriented five-year integrated Master of Science programme in physical science or a B.Sc. degree course in physics. You can opt for astrophysics for your postgraduate course. Full-time research in astrophysics or astronomy can be taken up usually after completion of master's degree, in which students must score at least 55 per cent marks. Students in their final year of postgraduate course can appear for the National Eligibility Test (NET) for Junior Research Fellowship and Lectureship conducted by CSIR-UGC. Those who qualify get a monthly fellowship for research in astrophysics leading to a doctorate degree. Those who obtain higher qualification including doctorate degree in astrophysics can become astrophysicists or scientists in research and development establishments. The Indian Space Research Organisation (ISRO), Indian Institute of Astrophysics, Bangalore, Vikram Sarabhai Space Centre (VSSC) and Space Application Centres are the major centres that provide job opportunities to those with a doctorate degree in astrophysics or astronomy. Those who qualify for the CSIR-UGC, lectureship or Ph.D. can become lecturers in universities or colleges.